All the images on this page are used by permission of and are copyrighted by Gary D. Van Aken, 2001. 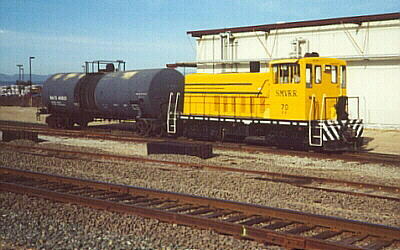 SMV's GP9 No. 1801 approaching Bell siding. 8-31-01. No. 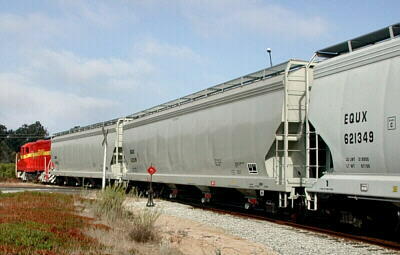 1801 spotting covered hoppers at Sonoco. 8-31-01. Shoving into the Sonoco spur. 8-31-01. Preparing to run around cut at Airbase Pass. 8-31-01. Switching at Bell siding; seven covered hoppers - three for Sonoco and four for Okonite and one tank car for the team track back at the yard. 8-31-01. Crossing Brown Road on the way to Guadalupe. June 2001. Arriving at the Guadalupe yard. June 2001. On the main line departing Bell siding for the Guadalupe yard. June 2001. Switching at Bell siding. June 2001. Delivering cars to the Guadalupe yard. June 2001. No. 70 heading back to Santa Maria. June 2001.